Michael R. Underwood is an author, podcaster, and publishing professional. His series include the Ree Reyes Geekomancy books, the Stabby Award-finalist Genrenauts series, and Born to the Blade. He’s been a bookseller, sales representative, and the North American Sales & Marketing Manager for Angry Robot Books. He is also a co-host on the Hugo Award Finalist The Skiffy and Fanty Show and Speculate! The Podcast for Writers, Readers, and Fans. Mike lives in Baltimore with his wife, their dog, and an ever-growing library. He also loves geeking out with games and making pizzas from scratch. 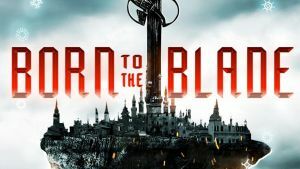 Welcome and congratulations on the release of episode one of Born to the Blade! Without giving too much away, would you care to give folks a taste of what the series is about? Born to the Blade is an epic fantasy series following three prominent bladecrafters in and around the Warder’s Circle – a diplomatic organization based in a free city built on a three-tiered flying city. Bladecraft works by drawing edged metal through the air in specific patterns called sigils. The warders wheel and deal and settle disputes between nations in ritual magical combat. Readers can expect diplomacy and subterfuge, magic and swordplay, and characters torn between their personal loyalties and duty to their home nations. On your blog, you describe working on the series with Marie Brennan, Malka Older, and Cassandra Khaw, as a TV-writers-room-esque situation. Could you tell us a bit more about the collaborative process? Do you literally (or virtually) sit in a room together and hash out scenes, arcs, and plot points? Do you lob drafts back and forth between team members, or is it a divide-and-conquer kind of thing? Has working as part of a team had any impact on your solo writing process? The Serial Box process is really cool, and unlike anything I’d done before as a writer. Last summer all four of us had a weekend-long in-person writers’ summit with Julian Yap (the co-founder of Serial Box). Everyone came to the summit having read the 30+ page world document I’d created, and we launched from there into conversations about what we wanted to do with the series, the characters, etc. We worked and re-worked the material, then laid out the season from there. We kept developing the world even after the summit, as it turns out that there’s a lot of worldbuilding to do when you have people from over a half-dozen nations thrown together and coming into connection and conflict! A big surprise to other writers, I’m sure. Each episode (we had eleven in season one) was assigned to one writer, but every member of the team provided feedback on each episode, so that each each represented our shared ideas and consensus on characterization, plotting, etc. Working with Malka, Cassandra, and Marie has helped me gain a stronger understanding of different approaches to storytelling – it’s been much easier to see the contrast clearly when we’re all working with the same characters and world. I haven’t written a lot of my own fiction since we wrapped up the edits on season one, but the biggest craft lesson I feel like I’ve learned so far is how to more clearly delineate a character arc across numerous story beats. I’m looking forward to writing a new project where the character’s agenda drives the story in a very powerful way (for this type of character-driven storytelling, think Javier Grillo-Marxuach’s idea of Operational Theme and series like Breaking Bad). Born to the Blade isn’t your first foray into episodic fiction. Genrenauts also has a TV series feel, with each episode seeing your characters visiting a different genre world and solving a problem there. What draws you to the episodic format? Speaking of Genrenauts, are there any particular genres and tropes you’re itching to play with that you haven’t explored yet? As a life-long fan of comics and TV, a pretty large portion of the works that inspire me were told in episodic format – Babylon 5, Leverage, X-Men, Planetary, Buffy the Vampire Slayer, etc. The other major factor is that episodic fiction is easier to keep in readers’ minds – if you write a novel a year, you have one new release every 365 days. Born to the Blade has eleven release days per season. Genrenauts has five or six. This is also advantageous because the Amazon algorithms are more likely to be favorable if you have a very recent release, so an episodic project keeps your works in the good graces of the Black Box of Amazon for more of the year. For Genrenauts, I’m very eager to try to see what I can say to add to the conversation in the Horror genre, and I’m excited to play around with the tropes of urban fantasy, utopian science fiction, historical romance, and, with some more research and expert consultation, non-Western narrative genres like wuxia. Until recently, you were the Sales & Marketing Manager for Angry Robot Books. How, if at all, did your roles on both sides of the publishing equation inform each other? Is there a particular piece of advice, wisdom, information about what goes on behind the scenes in turning an author’s vision into the reality of a book that you want authors to know about? Those two jobs were constantly feeding off one another. I’ve been able to bring a much stronger sense of the marketplace and how to position a work, which I’ve used in writing stronger pitches, applying strategies developed for AR in my own work, writing my own sales copy, etc.). And because I’d been around the author block a couple of times, I had a better sense of what authors need to know and are often worried or curious about that I could address with them. The biggest lesson I’d share with authors is that while your book may be unique, you need to know how to compare it to other novels/books/etc. If you’re publishing in USA, CAN, and the UK, it needs to be classified into BISAC or BIC genre categories. You need to be able to tell sales teams and buyers what existing books it might sell like. You need to be able to use comparisons by tone, character, genre, or other content to help readers get a sense of what to expect from your work. An agent will help you sell the novel to a publisher, but you will keep on having to sell it yourself, to readers at conventions, festivals, and on a plane when someone asks what you do and you actually want to talk about your work. Reading widely in your field and learning how publishers and authors talk about their books will help you get better at doing this for your own stuff. You can also talk about the plot hook for the series or what makes the main character(s) compelling. Readers look for different things from their fiction, so each will respond to different pitch styles. And you can always keep adjusting your hand-selling pitches, learning as you go. Almost six years after my debut, I still find myself in a position to pitch my debut novel, so the work never ends. As part of the Skiffy and Fanty and Speculate! podcast teams, you interview authors, review work, talk about the craft of writing, and generally get to geek out with your fellow podcasters about cool, nerdy things. What works, authors, or speculative fiction properties, are you particularly excited about at the moment? If you could signal boost one or two “hidden gems” more people should be reading/watching/talking about who or what would they be? I’m really enjoying a video game called Slay the Spire, which is a run-based roguelike card game. Each run, you pick your class and build your deck from a small base deck as you climb a tower of enemies, have strange encounters, and loot. For folks somewhat in the gaming world, think Dominion but a dungeon crawl. Since Slay the Spire is run-based/roguelike, it’s incredibly re-playable, and lets you get some of the fun of collectible card games for a fraction of the cost. The game is in early access on Steam right now, so it’s constantly being updated and improved. The third character was just added on a test server, and I’ve been having a ton of fun trying to figure them out. The other thing I’d shout-out is the GLAAD and Eisner-nominated comic series Kim & Kim by my friend Magdalene Visaggio (writer) with Eva Cabrera (line art), Claudia Aguirre (color art), and Zak Saam (letter art). It’s an irreverent technicolor science fantasy about bounty hunter besties who are constant screw-ups. It has incredibly strong character voices, inviting and kinetic art, and features a variety of LGBTQ characters. There are two volumes available right now (The Glamorous High-Flying Rockstar Life and Love is a Battlefield) and there’s an ongoing series coming soon, called Oh S#!t, it’s Kim & Kim. Switching gears a bit, there are a fair number of speculative fiction writers living in and around the Baltimore area. What do you see as some of the more fantastical, or science fictional elements of the city that make it a draw for writers? In general, what are your favorite spots in the city, or places you recommend to people visiting Baltimore for the first time? Baltimore has a lot of cool history to draw on – the neighborhood of Fell’s Point was home to privateers, it was the home of a major battle of the War of 1812 (aka the battle where “The Star-Spangled Banner” was composed). A lot of people know The Wire, but there’s way more to Baltimore than that. All of those give writers powerful touchstones to build on, re-interpret, or to challenge with speculative fiction. But enough about cool history – Baltimore is also a city with sharp income inequality, systemic racism and classism, a history of police abuses, etc. – all of which can directly inspire cyberpunk storytelling and/or any type of social science fiction. For first-time visitors to Baltimore, I highly recommend the National Aquarium, the American Visionary Art Museum, or just a walk around Fell’s Point. Now that Born to the Blade is making its way out into the world, what’s next for you? Is there anything else you have upcoming or that you’re working on that you’d like people to know about? I’m finishing up revisions on a space opera novel that my agent will be sending around to publishers. I’ve been working on this one off-and-on for a couple of years, and I’m very excited to see how people respond to it. After that, I’m going to be breaking ground on Genrenauts season two and working on some comics projects to pitch. That all sounds awesome! Thanks for dropping by! Thanks so much for having me on for a chat!